By day Andrea Gini is part of ESTEC’s TEC-QI team, assessing the safety of payloads due to fly to the ISS. Outside of work hours he plays a very different role in the same field, as editor-in-chief of Space Safety Magazine. 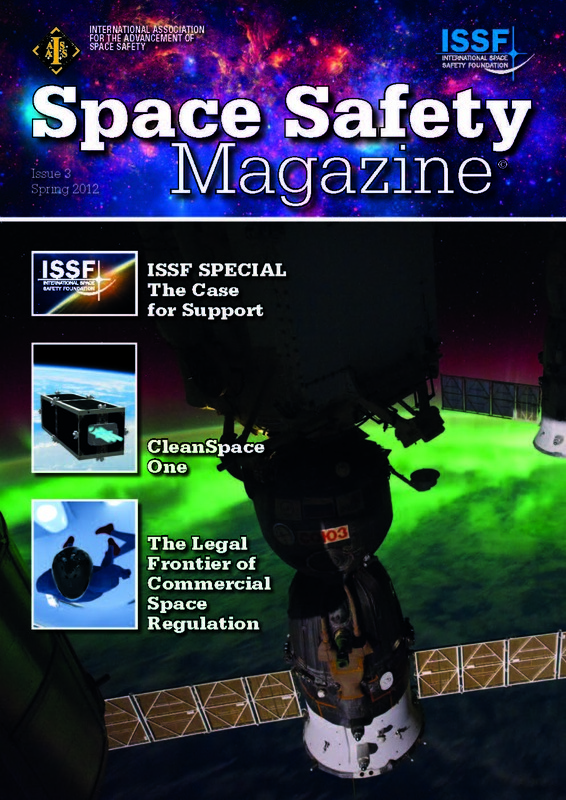 This glossy quarterly, its fourth issue scheduled for the first week of July, is the magazine of the International Association for the Advancement of Space Safety (IAASS), distributed in print format at major conferences through sponsorship deals with partner organisations – most recently the International Space Safety Foundation (ISSF) – and downloadable via its website. The response from readers has been extremely positive, part of which Andrea says might be down to the title: “It’s very clear what we’re talking about, which wouldn’t be the case if we were called Astra or something non-specific like that. 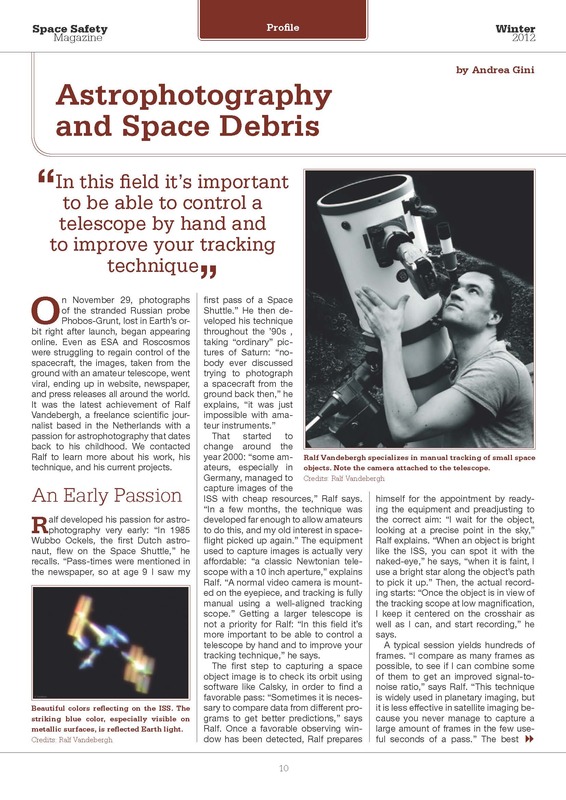 Space Safety Magazine developed from the former IAASS newsletter, when we decided to reach out to non-members and the wider space industry. “We cover both manned and unmanned spaceflight, considering risks to human life across all mission phases, not just crews on board but spacecraft manufacturers and operators, technicians at the launch pad and, ultimately, the general public. “The latter is particularly significant because while astronauts know they are running some risk from space operations, ordinary people generally do not, at least not until high-profile satellite re-entries like the recent UARS or RORSAT makes the headlines. “At the same time, we seek to give a fuller picture about how risk is managed in the space industry, and why these risks are run in the first place – not just because ‘launching stuff in space is cool’, but because of the practical benefits that come back from space systems, like Earth observation and satellite navigation, which actually deliver safety down on Earth. It takes about six weeks to put each issue together, along with an extra hour or so daily to maintain the website. The work is voluntary, but Andrea regards it as an opportunity to combine professional interests. 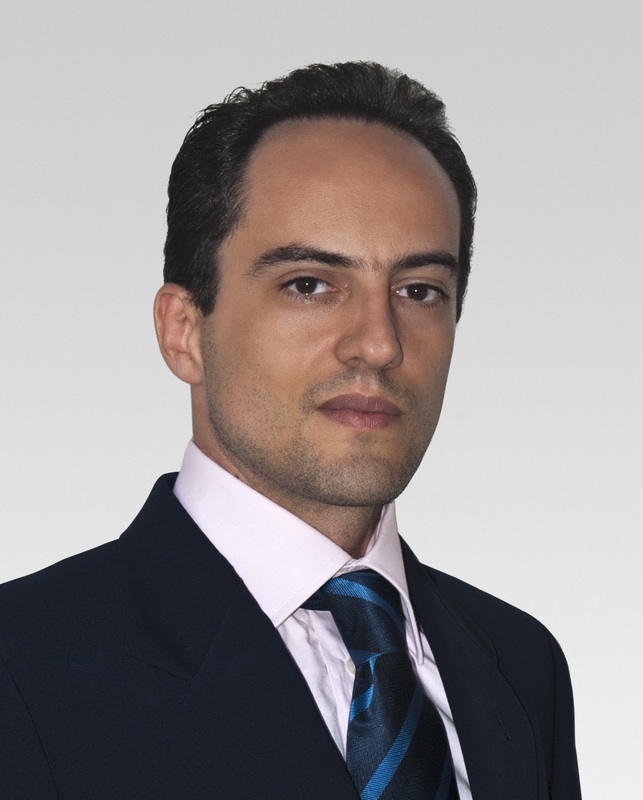 He originally trained as a software engineer and science journalist before attending the International Space University in Strasbourg in 2009 to pursue a lifelong passion for space. Andrea put together the first issue more or less alone, but other contributors soon emerged, including, veteran aerospace journalist Leonard David of Space.com and the Secure World Foundation, noted satellite photographer Ralf Vandebergh, safety professionals from industry and agencies and a group of fellow ISU alumni led by Deputy Editor Merryl Azriel, the main coordinator of the Space Safety Magazine website. The next issue features an interview with space debris expert Donald Kessler, whose ‘Kessler Effect’ model of runaway space debris will be immortalised next year in the Hollywood movie Gravity. 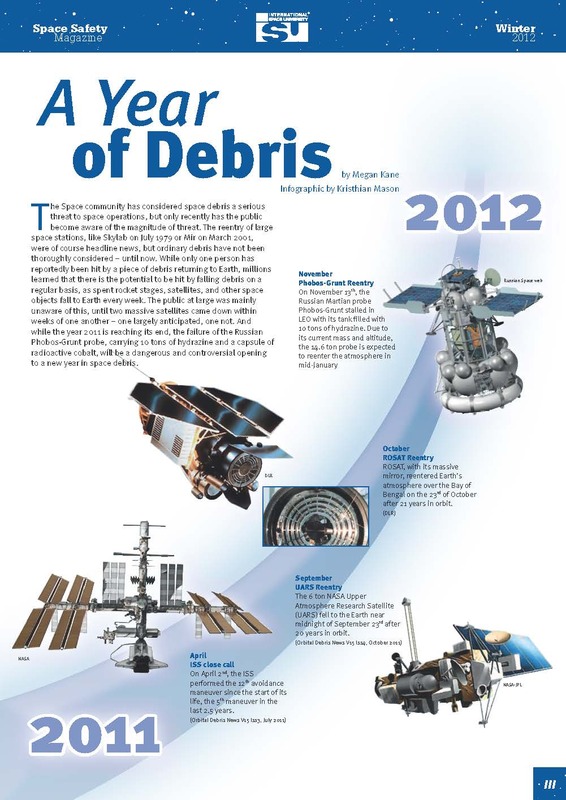 The IAASS was formed nine years ago by an international group of space safety professionals. Among its achievements to date there is a series of three dedicated textbooks on the subject, with the first one, Safety Design for Space Systems, recently translated in Chinese. “The organisation has various goals, including establishing a professional certification course in space safety with the potential to become a master’s degree as well as setting up an institute on the subject. “Ensuring safety is not just a moral duty but a prerequisite for our space programme to continue evolving. For example, the Space Shuttle was cancelled, and all its excellent capabilities lost, because of a safety issue. The Shuttle was designed on wrong assumptions regarding its reliability, resulting in a lack of crew escape facilities. After the Challenger disaster, and even more so after the Columbia re-entry breakup, the operational costs skyrocketed just to keep it flying at an acceptable level of safety. “And even with unmanned missions there is little room for error. When a mission like Phobos Grunt fails, it isn’t just the re-entry danger that’s a problem to report, but also the loss of an incredibly ambitious science mission. It’s very rare that missions can be salvaged in flight – Hubble and the Galileo Jupiter probe being welcome exceptions.